The whole concept of Lizzie Borden’s home turned into a bed-and-breakfast museum seems like something Supernatural might conjure up. Except, it’s real. Really. Look it up. If you’re like Sam, you can totally geek out and actually spend a night at the infamous accused axe murderer’s abode in Fall River, Massachusetts. Me? I’ll pass and stick to watching the Winchesters check the area out from the comfort of my own place. 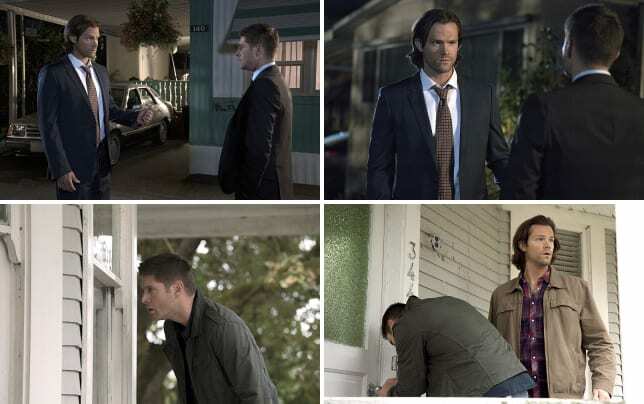 Supernatural Photos from "Thin Lizzie"
Granted, with Supernatural Season 11 Episode 5 playing up the ghostly vibe and tension as Sam and Dean tackled the case of the week, I definitely felt like I got a real taste of the residence. And I was actually looking forward to seeing the brothers take on a haunting, as it’s felt like a while since their last ghost hunt. The outset of their search was definitely creepy from the music to the darkness of the place as they slowly walked around. I even expected a jump scare, but one never came. Instead, the brothers were able to debunk the mystery, discovering sound systems and lights set to flicker on a timer or even a machine that would make an EMF meter go off. It was a solid twist, but it didn’t quite answer the reason for the murders. Then as the murders around town started stacking up, I began to wonder if Sam and Dean were actually going to be just trying to stop some crazy human serial killer. 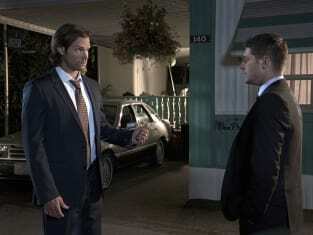 Remember Supernatural Season 4 Episode 11, “Family Remains”? What the brothers thought to be a ghost turned out to be a crazed human. So it was a clever and solid turn when the seemingly case of the week turned out to be connected to the Darkness. This wasn’t just some throw away episode that was scary and solved by the end. And it was good to see that the hour didn’t devolve into some cheesy or campy mess. It really zeroed in on the Darkness growing, its affect on others, and how losing a soul can be very different for everyone. I was trying to figure out who the actual killer would be through Scooby Doo process of elimination, but I didn’t guess the babysitter until pretty much the reveal. But it was odd to see her embrace the Darkness with such gratitude and worship. It’s kind of scary to think that the Darkness could do that to all of humanity. Though, if there are others out there like Len, people who’ve lost their soul but can still find a way to do good, then there might be hope. Maybe? It really makes me interested in what the Darkness is planning as she greedily gobbles up souls. She certainly seems eager to see Dean soon enough. At least the brothers seem to be working together well enough that they can take on the Darkness as a team. And maybe Castiel will be able to help? I’m still not sure what the writers plan on doing with Castiel, but with Sam’s explanation that he was binge watching The Wire, I’m willing to let my concerns slide for now because, well, it’s The Wire. Let’s just hope Castiel doesn’t spend all season doing Netflix and chill though. That said, putting Sam and Dean at the core focus of the hour felt like some old school Supernatural. And I love that they are trying to keep on their new rules path, too. This was an entertaining episode that found a solid way to put the brothers on the trail of their monster of the week while incorporating the bigger story. It's good to see Supernatural Season 11 off to such a positive start. What do you think is the Darkness' plan? Did you think it was a ghost at the Borden house? Sound off below, and don't miss any Sam and Dean cases when you watch Supernatural online now. Note: Supernatural Season 11 Episode 6, "Our Little World," airs Nov. 11 at 9 p.m.
Sam: Maybe We're dealing with a serial killer? Dean: You'd love that wouldn't you. Permalink: You'd love that wouldn't you. Dean: Bottled toilet water? Why do you keep spraying it? Sam: I wanted to see if the squeezy thing worked. Permalink: I wanted to see if the squeezy thing worked. Supernatural Round Table: What's the Big Plan?